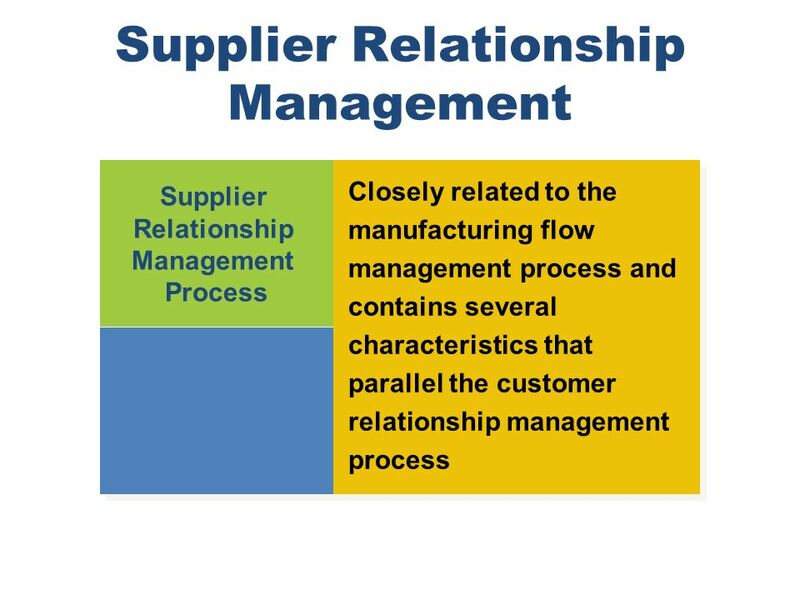 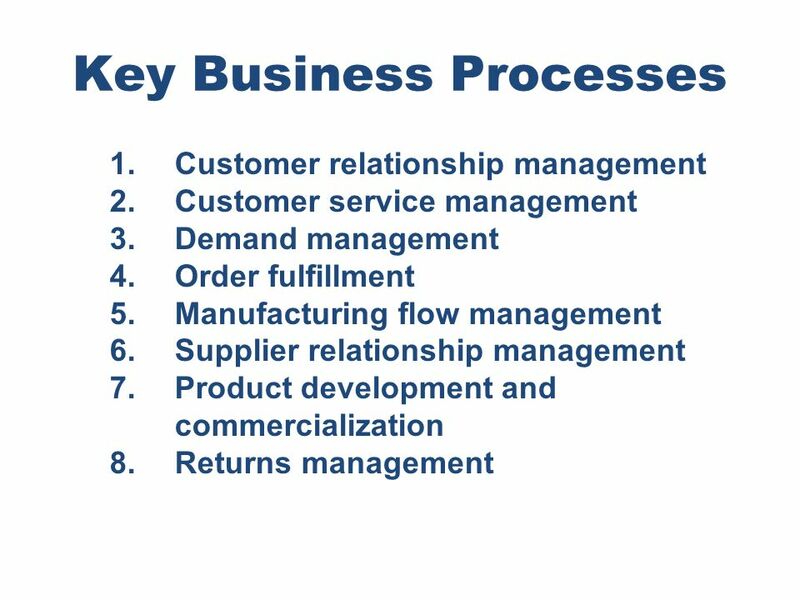 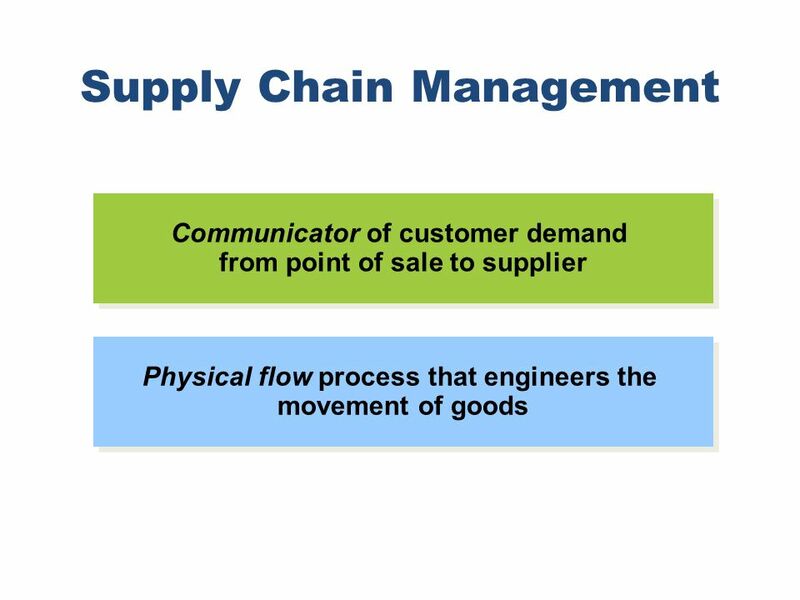 Chapter 14 Supply Chain Management Supply Chain Management Communicator of customer demand from point of sale to supplier Physical flow process that engineers the movement of goods Notes: Today, supply chain management plays a dual role. 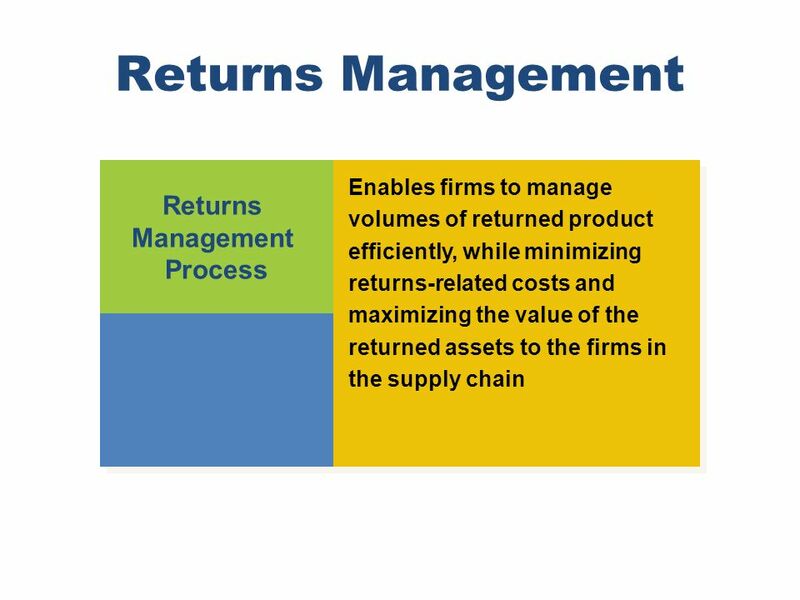 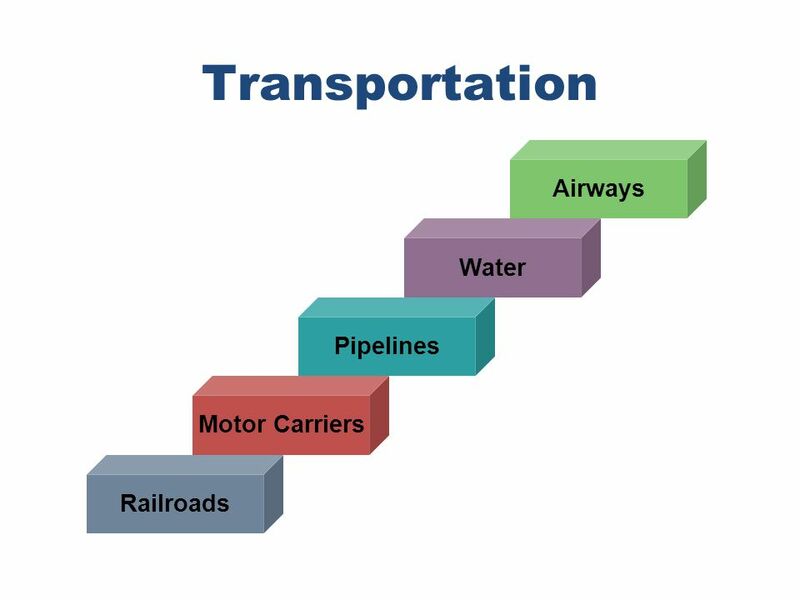 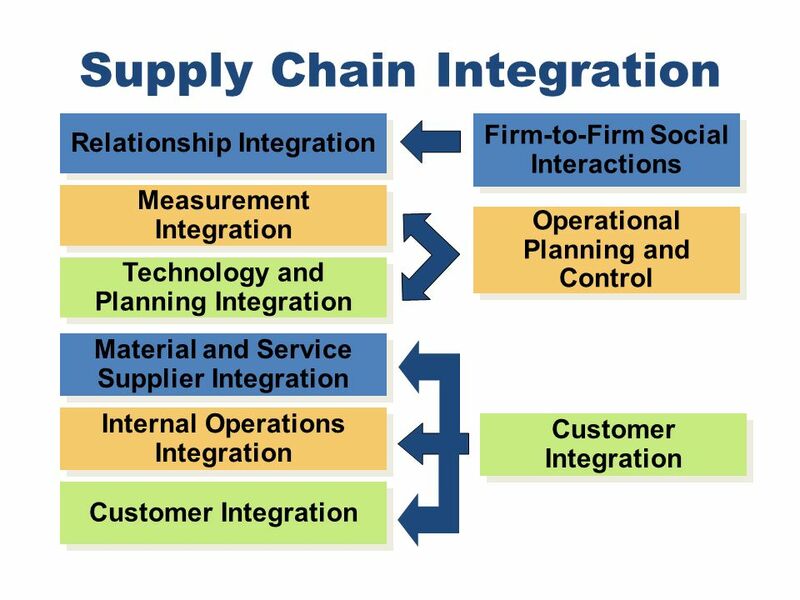 Supply chain management acts as a communicator of customer demand that extends from the point of sale back to the supplier, and second, as a physical flow process that engineers the timely and cost effective movement of goods throughout the entire supply pipeline. 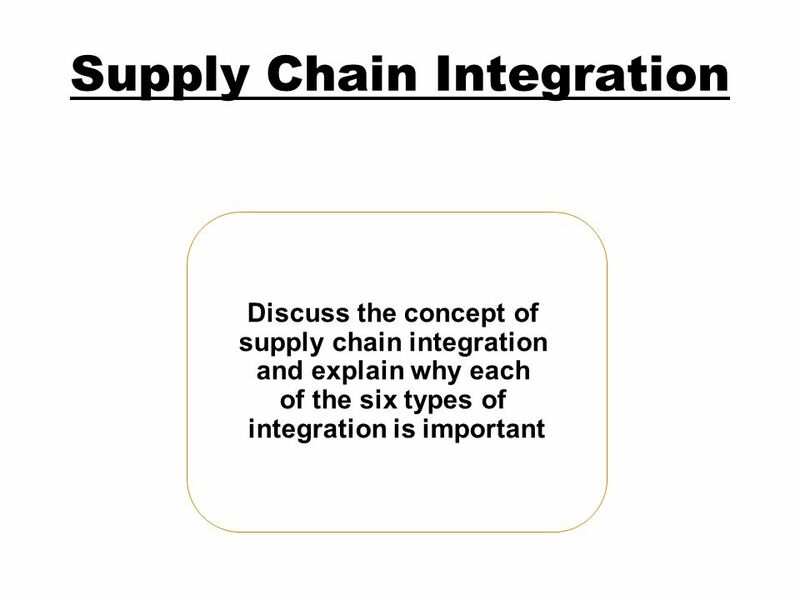 Chapter 14 Supply Chain Management Logistical Components of the Supply Chain Supply Chain Team Sourcing & Procurement Production Scheduling Order Processing Inventory Control Warehouse & Materials Handling Transportation Logistics Information System Notes: The supply chain consists of several interrelated and integrated logistical components, as shown on this slide. 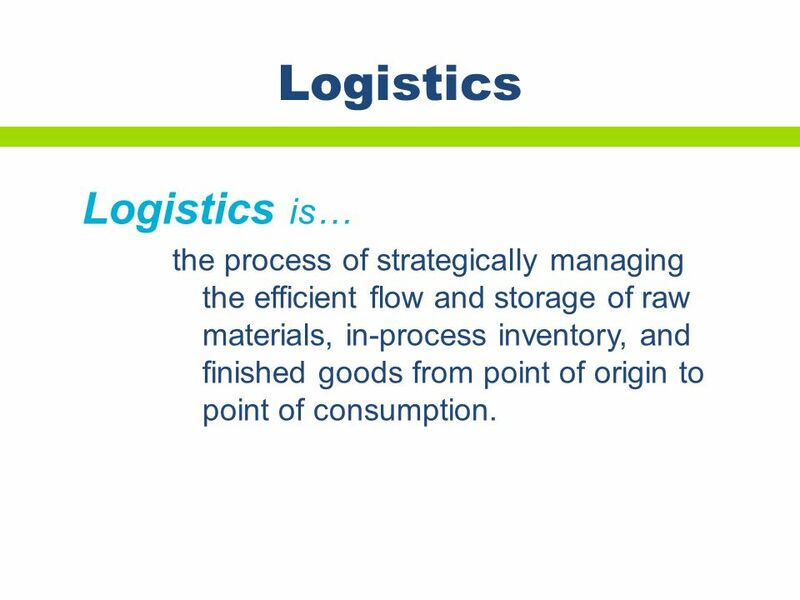 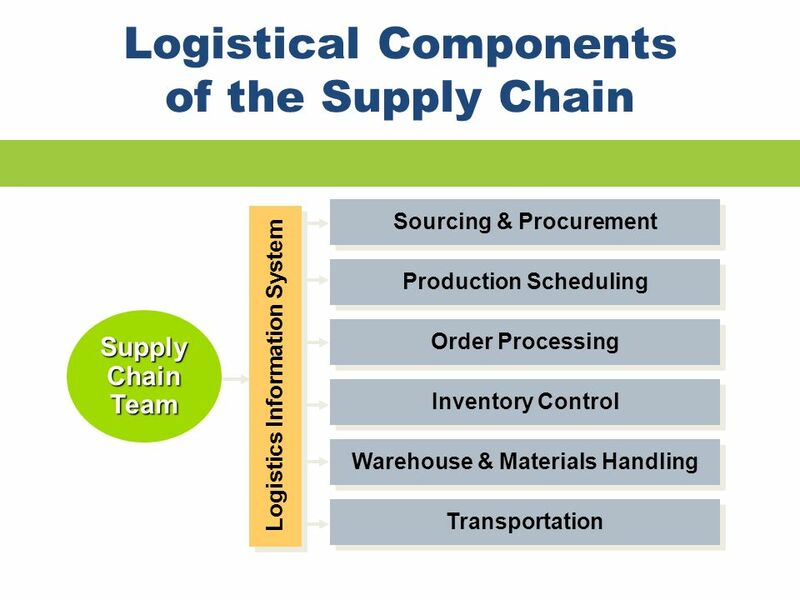 Integrating and linking all of the components is the logistics information system. 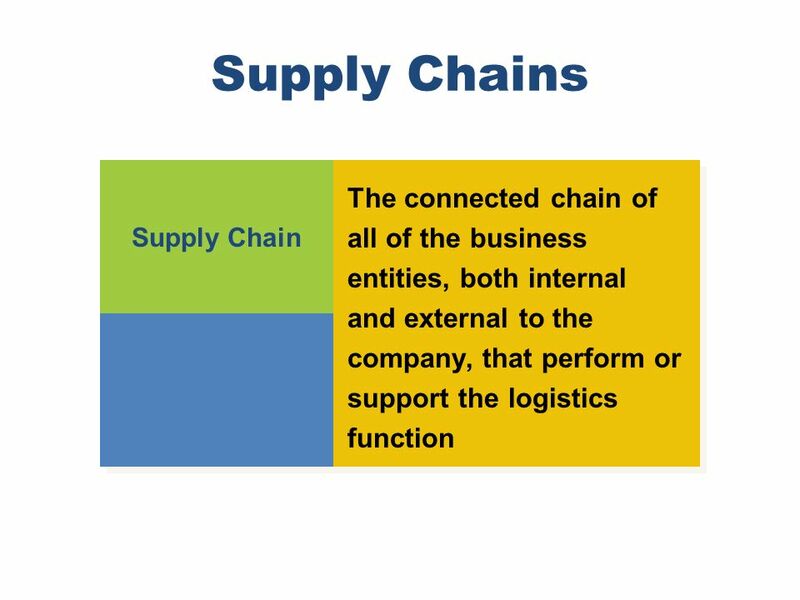 The supply chain team orchestrates the movement of goods, services, and information from the source to the consumer. 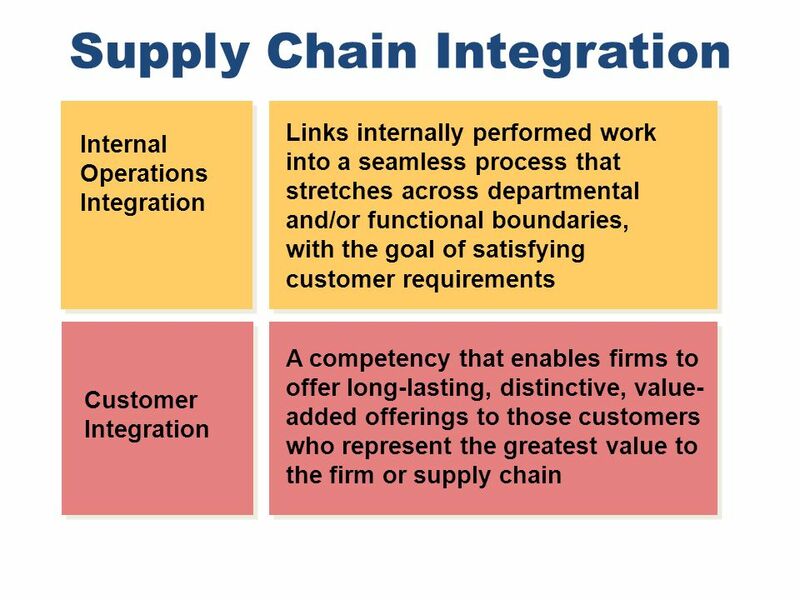 The best supply chain teams move beyond the organization to include external participants, such as suppliers, transportation carriers, and third-party logistics suppliers. 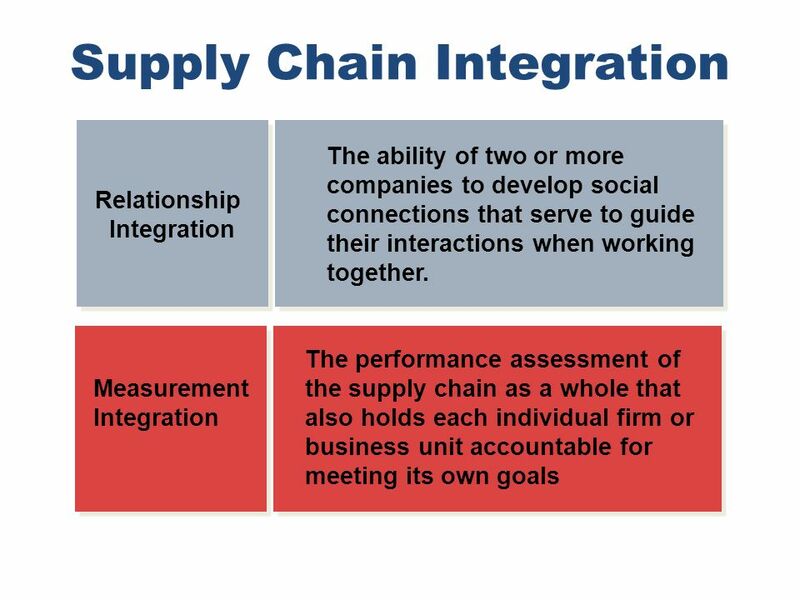 Members of the supply chain communicate, coordinate, and cooperate extensively. 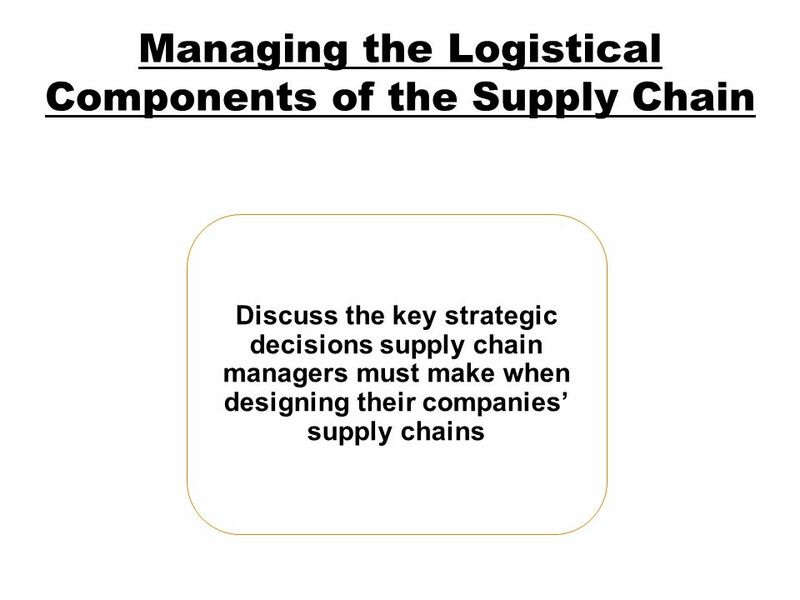 Chapter 14 Supply Chain Management Sourcing and Procurement The Role of Purchasing: Plan purchasing strategies Develop specifications Select suppliers Negotiate price and service levels Reduce costs © iStockphoto.com/Maria Toutoudaki Notes: One of the most important links in the supply chain is that between the manufacturer and the supplier. 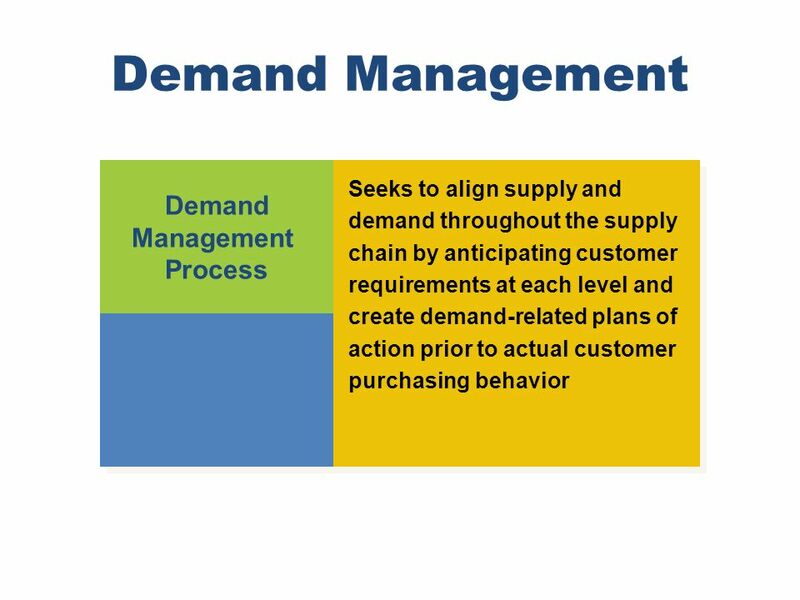 Purchasing professionals are on the front lines of supply chain management, planning purchasing strategies, developing specifications, selecting suppliers, and negotiating price and service levels. 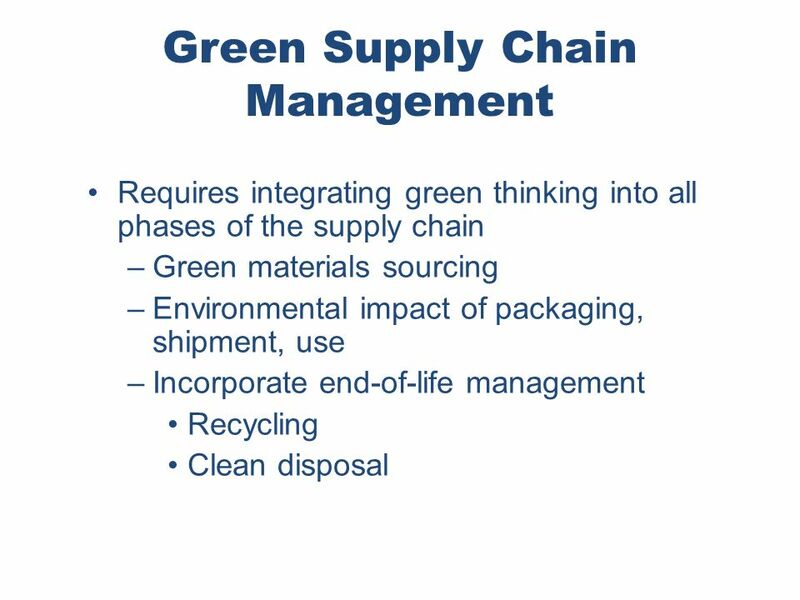 The goal of most activities is to reduce the costs of raw materials and supplies. 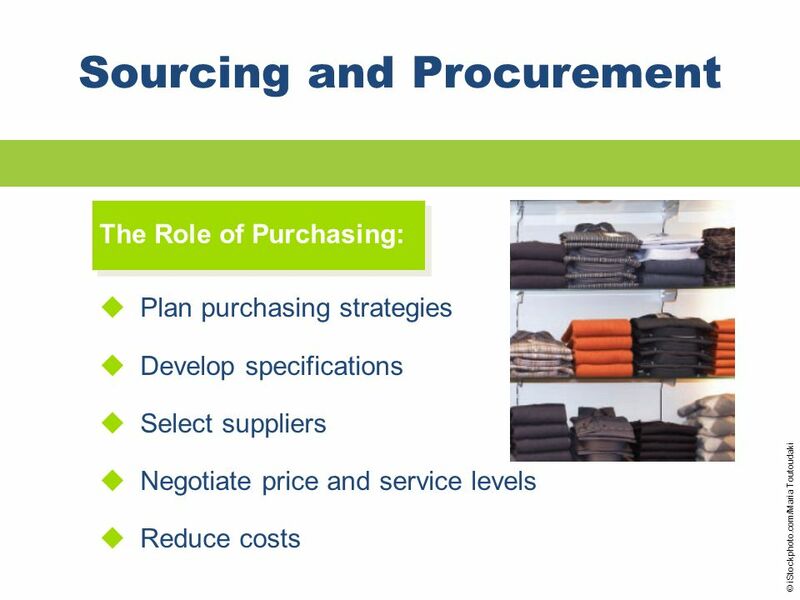 Instead of tough negotiations to get the best possible price, purchasing helps establish and cooperative relationships with vendors. 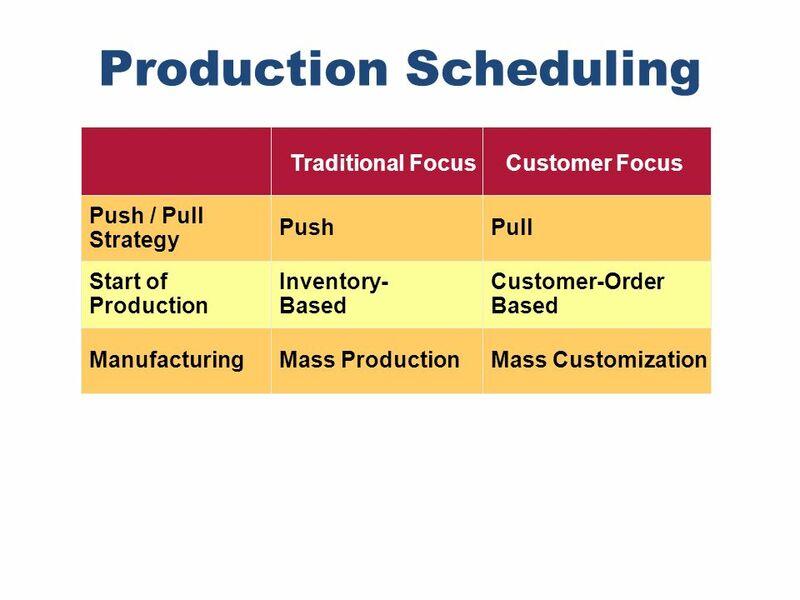 Chapter 14 Supply Chain Management Production Scheduling Push / Pull Strategy Traditional Focus Push Start of Production Manufacturing Inventory- Based Mass Production Customer Focus Pull Customer-Order Based Mass Customization Notes: In a traditional mass-marketing manufacturing, production begins when forecasts call for additional products to be made or inventory is low. 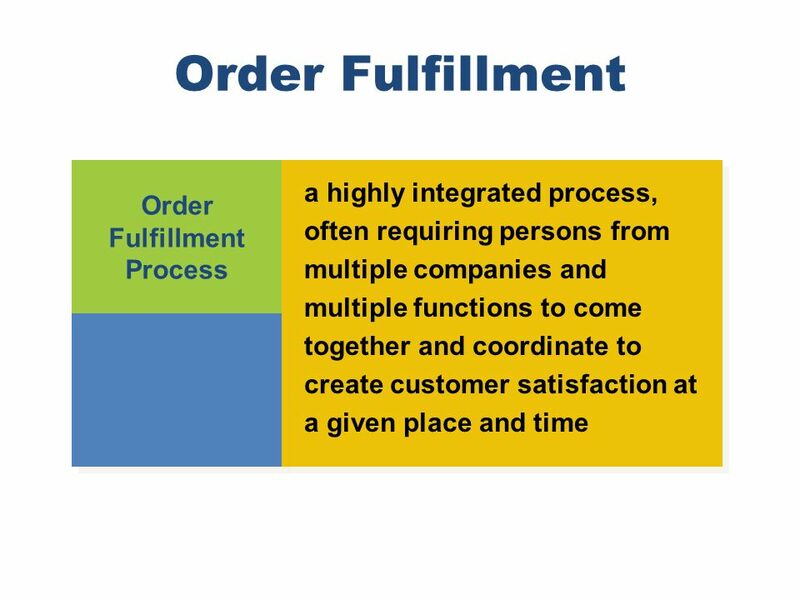 In a customer-focused “pull” manufacturing environment, production of goods is not started until an order is placed by the customer specifying the desired configuration, also known as mass customization or build-to-order. 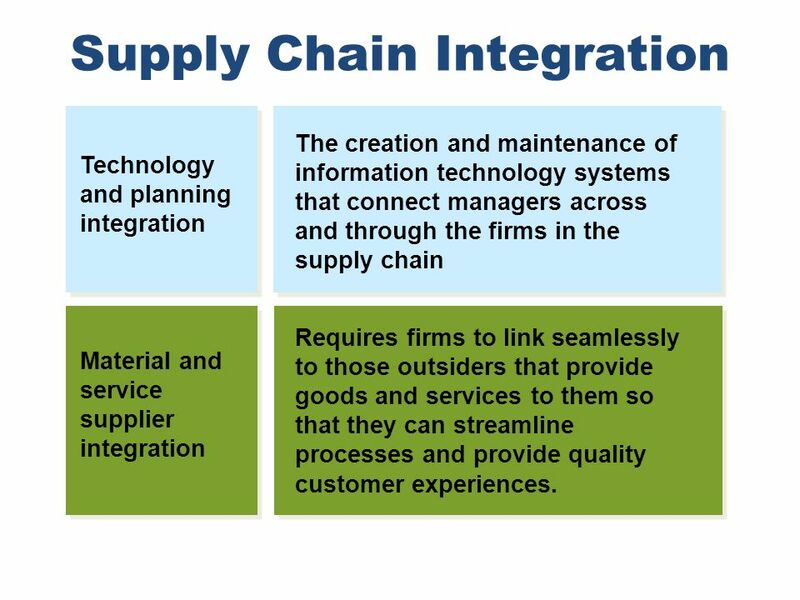 In this environment of customer demand and mass customization, supply chains need to be flexible and be able to shift production based on demand. 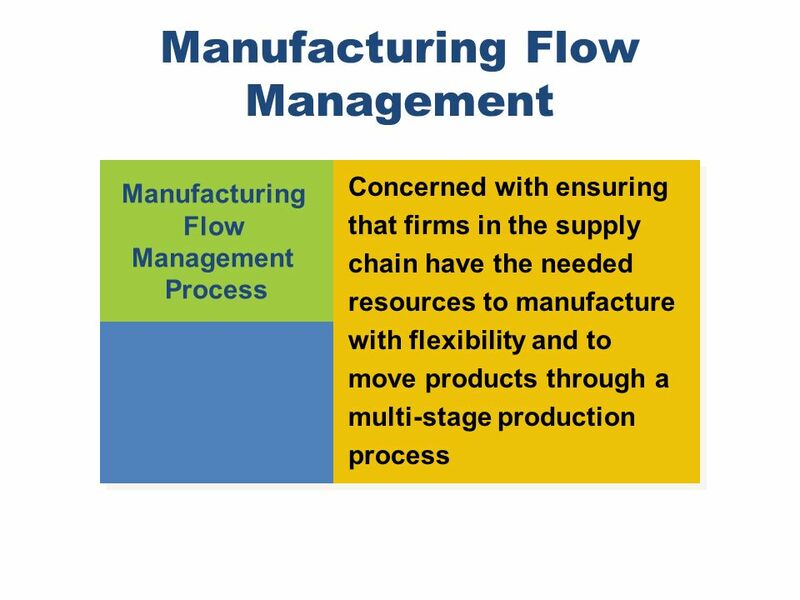 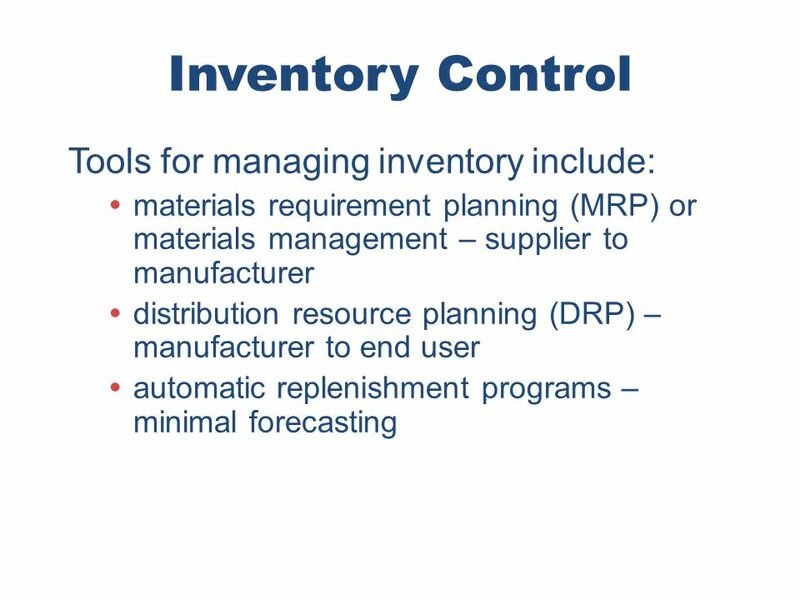 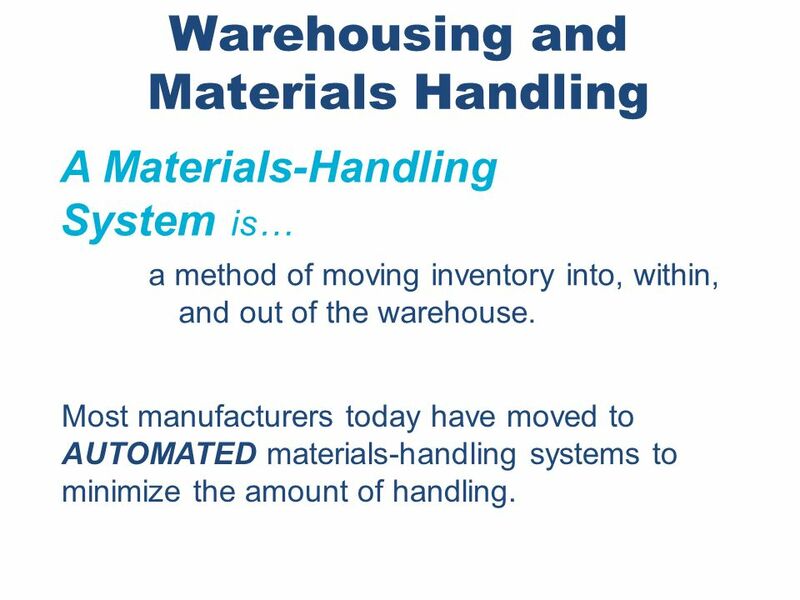 Chapter 14 Supply Chain Management Just-in-Time Manufacturing JIT A process that redefines and simplifies manufacturing by reducing inventory levels and delivering raw materials at the precise time they are needed on the production line. 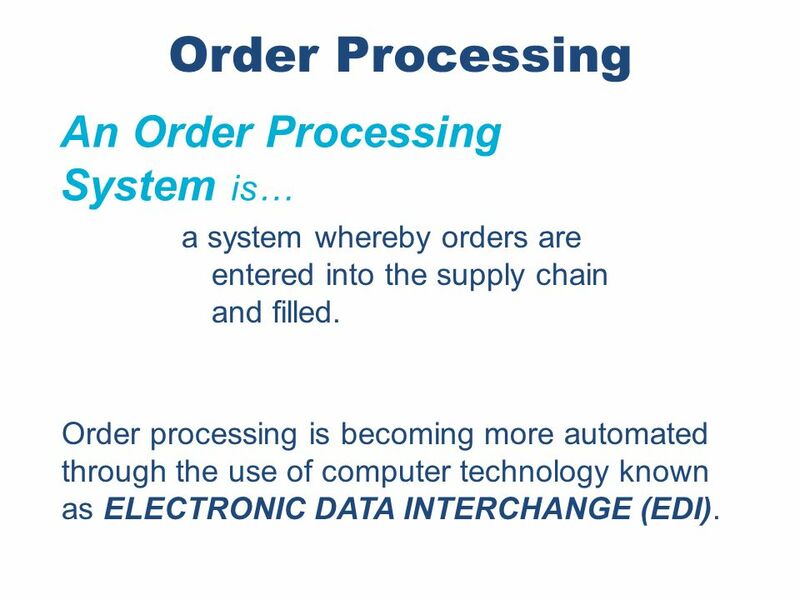 Notes: JIT, or lean production, was borrowed from the Japanese. 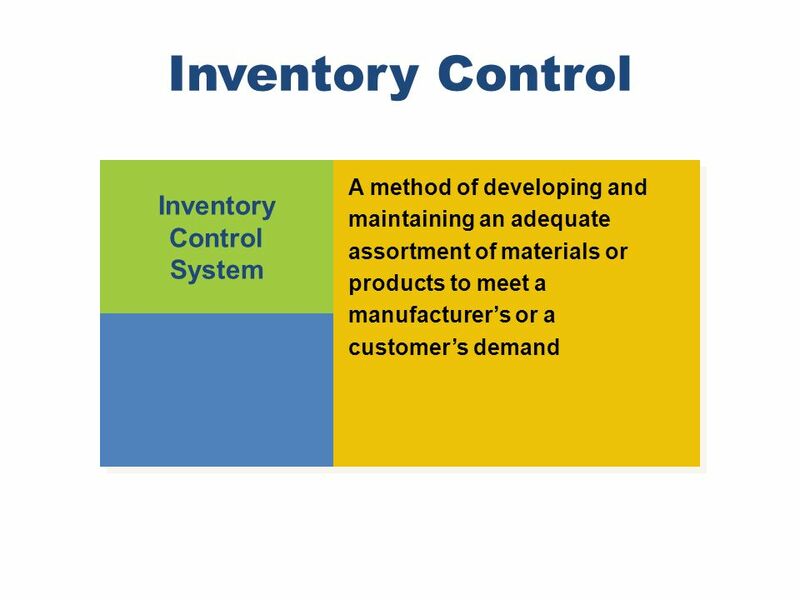 Manufacturers work with suppliers to get necessary items to the assembly line at the precise time they are needed for production. 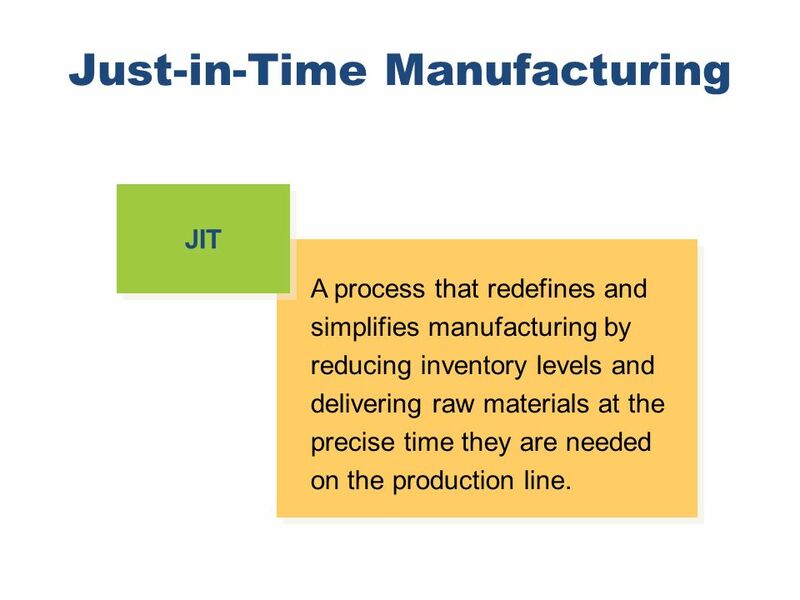 For the manufacturer, JIT means that raw materials arrive at the assembly line “just in time” to be installed. 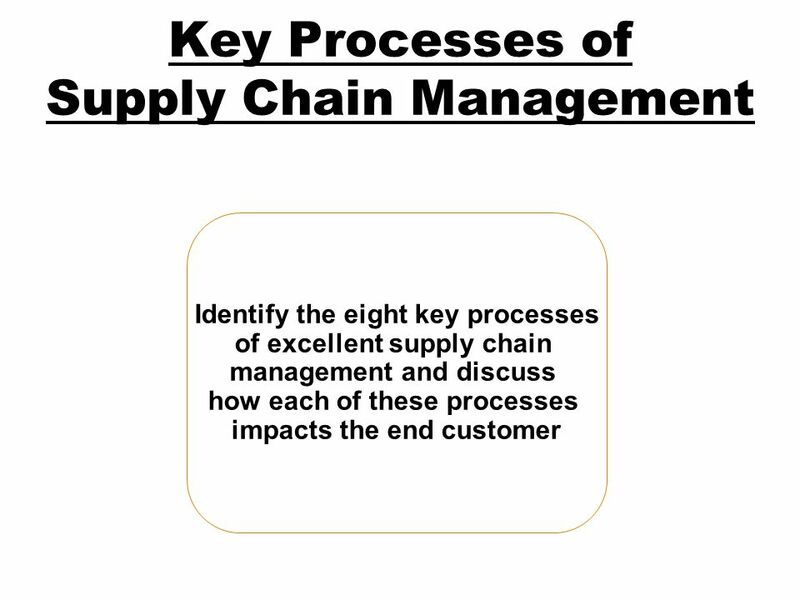 For the supplier, JIT means supplying customers with products in just a few days rather than weeks. 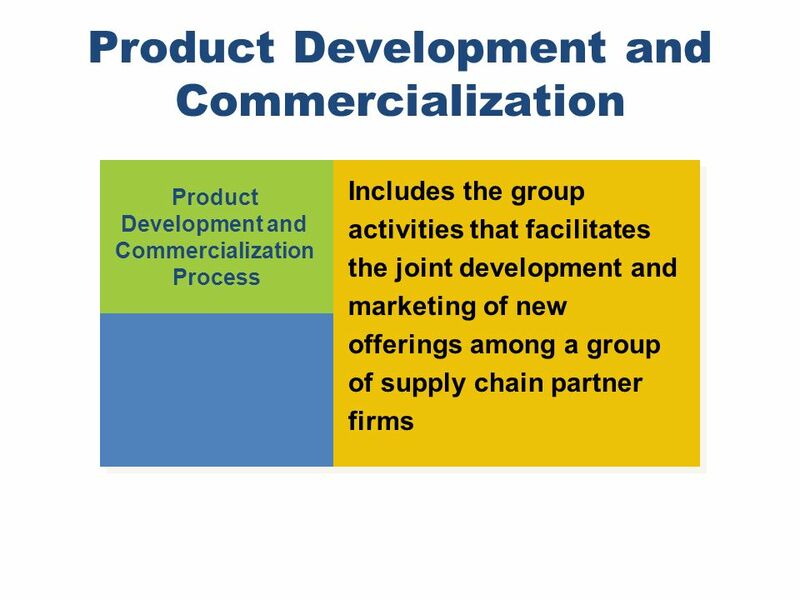 For the consumer, JIT means lower costs, shorter lead times, and products that closely meet the consumer’s needs. 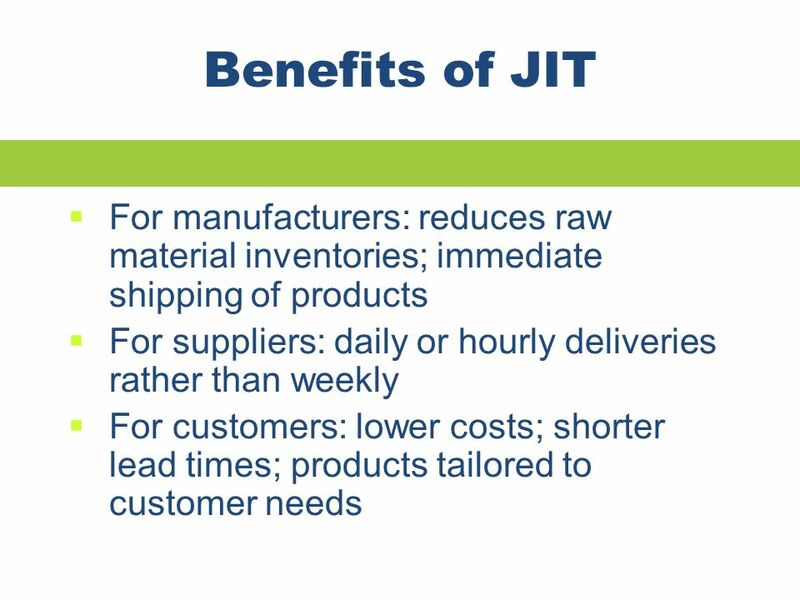 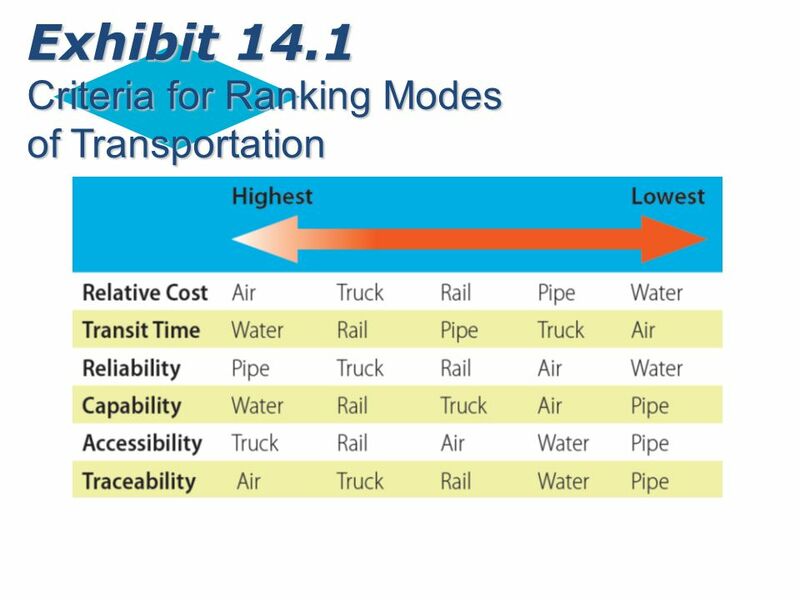 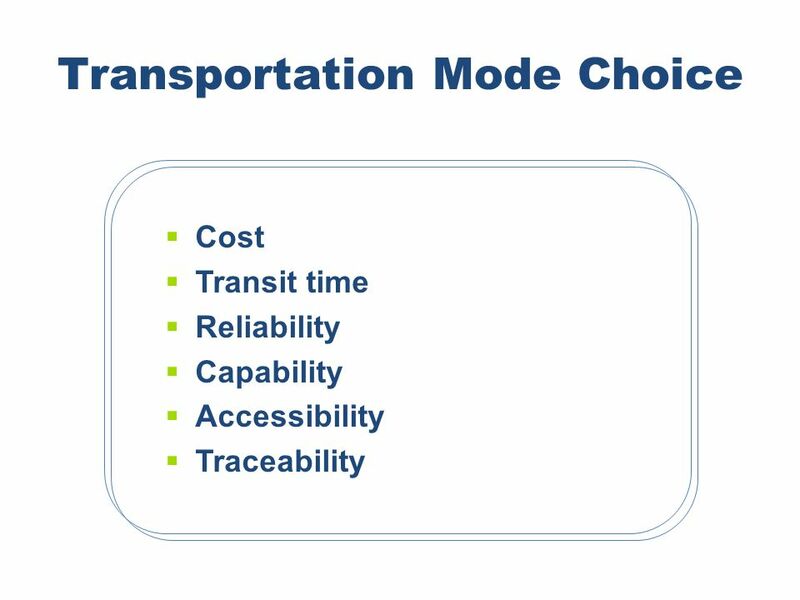 Benefits of JIT For manufacturers: reduces raw material inventories; immediate shipping of products For suppliers: daily or hourly deliveries rather than weekly For customers: lower costs; shorter lead times; products tailored to customer needs Notes: The benefits of JIT are shown on this slide. 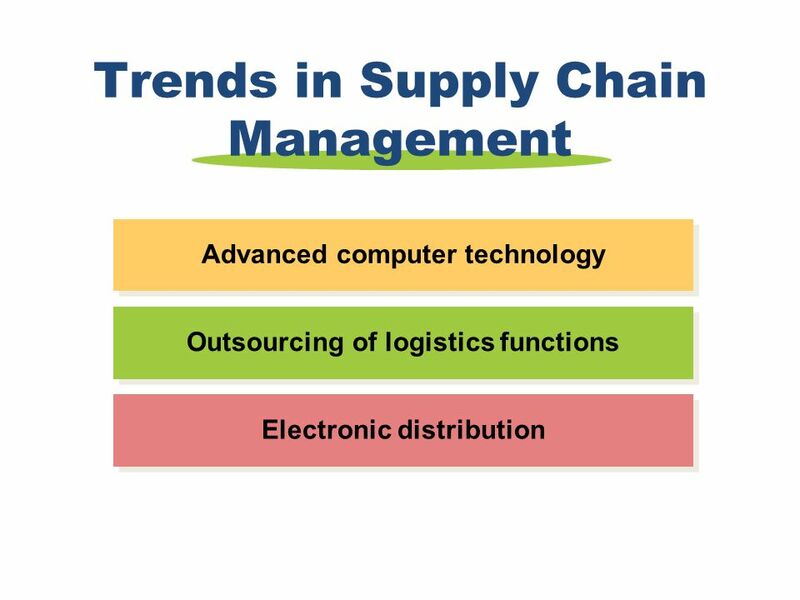 Chapter 14 Supply Chain Management Trends in Supply Chain Management Electronic distribution Outsourcing of logistics functions Advanced computer technology Notes: Several technological trends are affecting the job of the supply chain manager: Advanced computer technology has boosted the efficiency of logistics with tools such as automatic ID systems, radio frequency technology, and supply chain software systems. 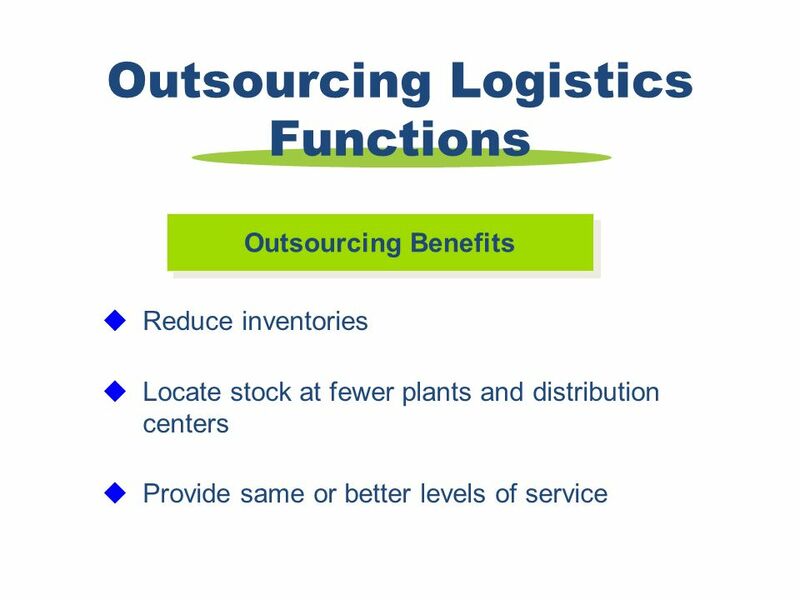 Outsourcing of logistics functions is a rapidly growing segment in which a manufacturer or supplier turns over the entire or partial function of supply chain management to an independent third party. 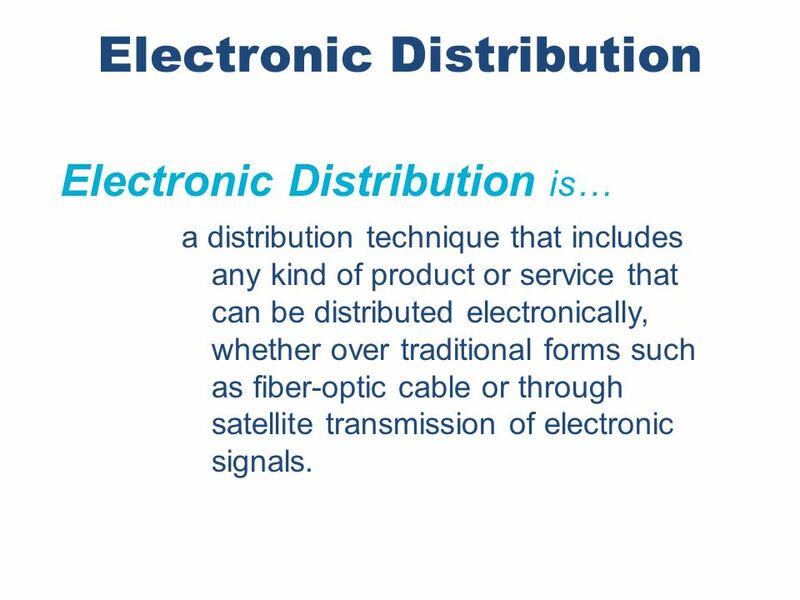 Electronic distribution includes any kind of product or service that can be distributed electronically. 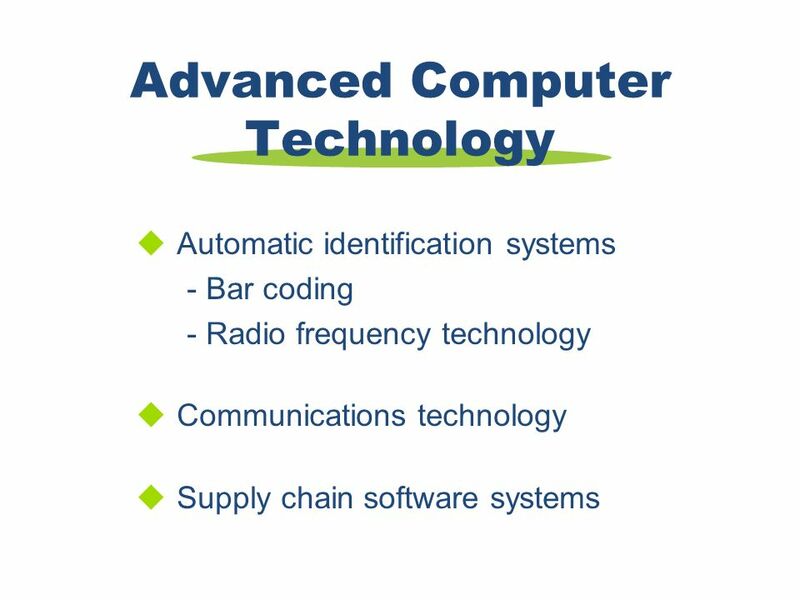 For instance, computer software can be purchased and downloaded electronically. 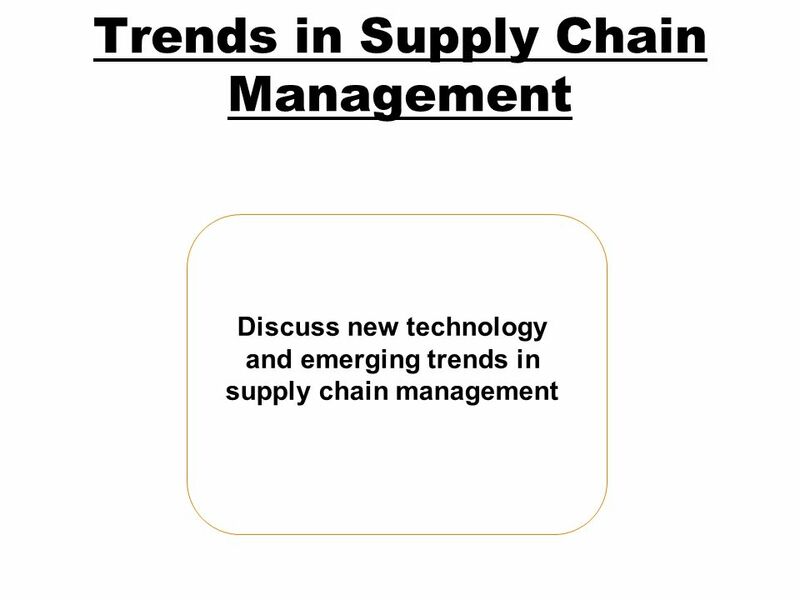 Chapter 14 Supply Chain Management Advanced Computer Technology Automatic identification systems - Bar coding - Radio frequency technology Communications technology Supply chain software systems Discussion/Team Activity: Discuss examples of the use of advanced computer technology from the text including Amazon.com, Walmart, and American Apparel. 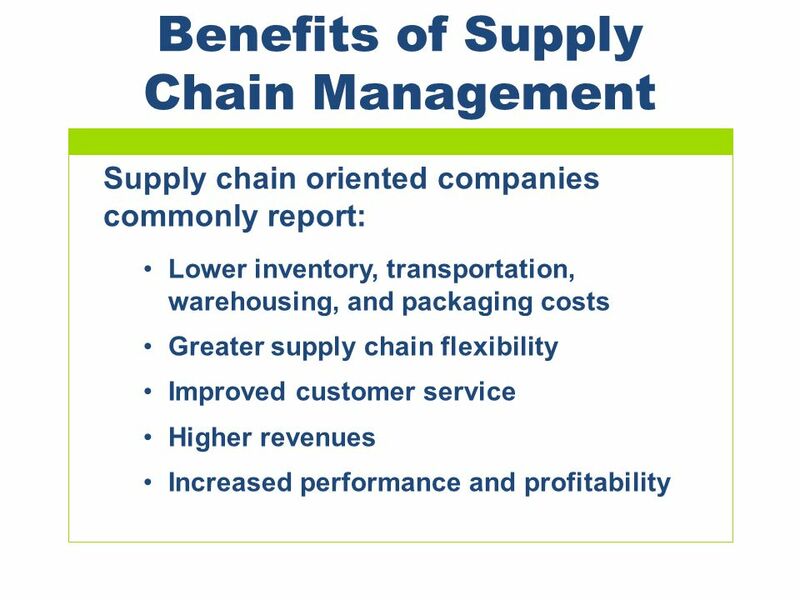 Chapter 14 Supply Chain Management Outsourcing Logistics Functions Outsourcing Benefits Reduce inventories Locate stock at fewer plants and distribution centers Provide same or better levels of service Notes: Turning their logistics functions over to firms with expertise in that area allows companies to focus on their core competencies. 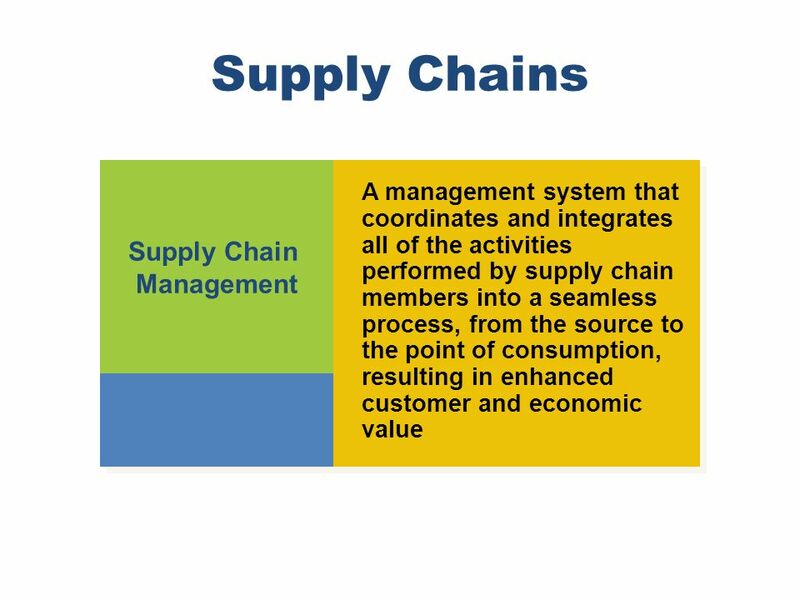 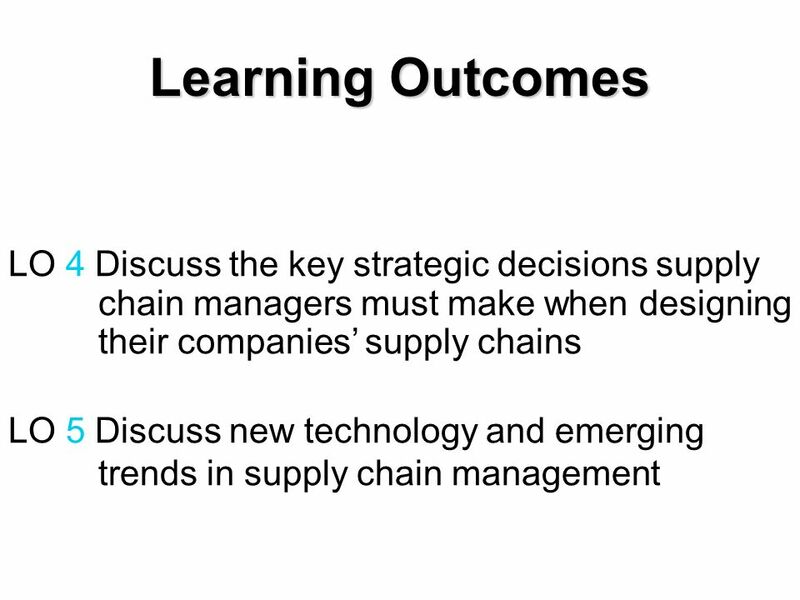 Download ppt "14 Supply Chain Management"
© 2002 McGraw-Hill Companies, Inc., McGraw-Hill/Irwin INTEGRATING SUPPLY CHAIN AND LOGISTICS MANAGEMENT. 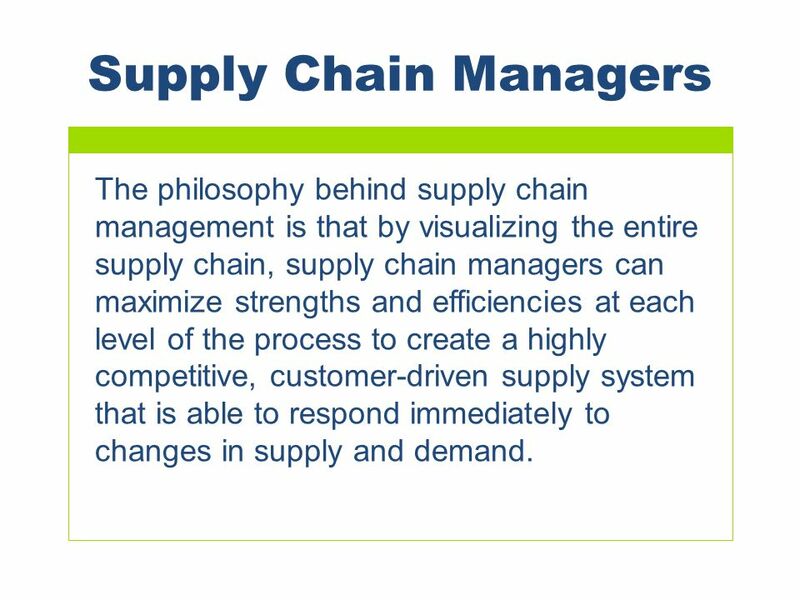 Copyright Cengage Learning 2013 All Rights Reserved 1 Chapter 14: Supply Chain Management Introduction to Designed & Prepared by Laura Rush B-books, Ltd.
McGraw-Hill/Irwin ©2008 The McGraw-Hill Companies, All Rights Reserved CHAPTER 8 SUPPLY CHAIN MANAGEMENT. 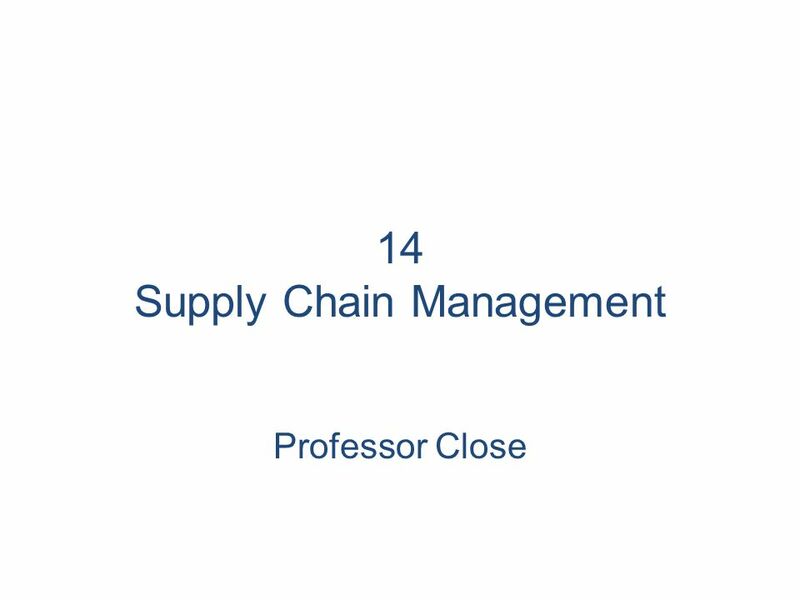 Chapter 12Copyright ©2008 by South-Western, a division of Thomson Learning. 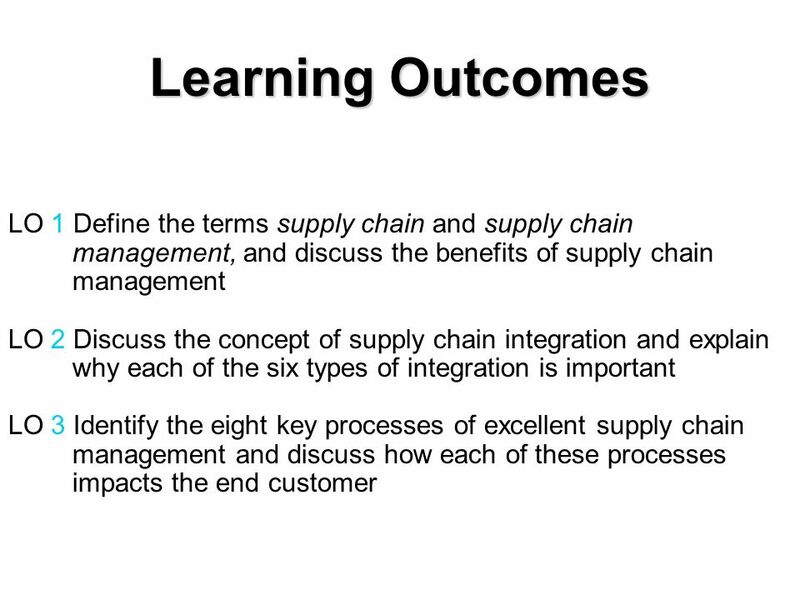 All rights reserved 1 Learning Outcomes Chapter 12 Marketing Channels  1.Explain. 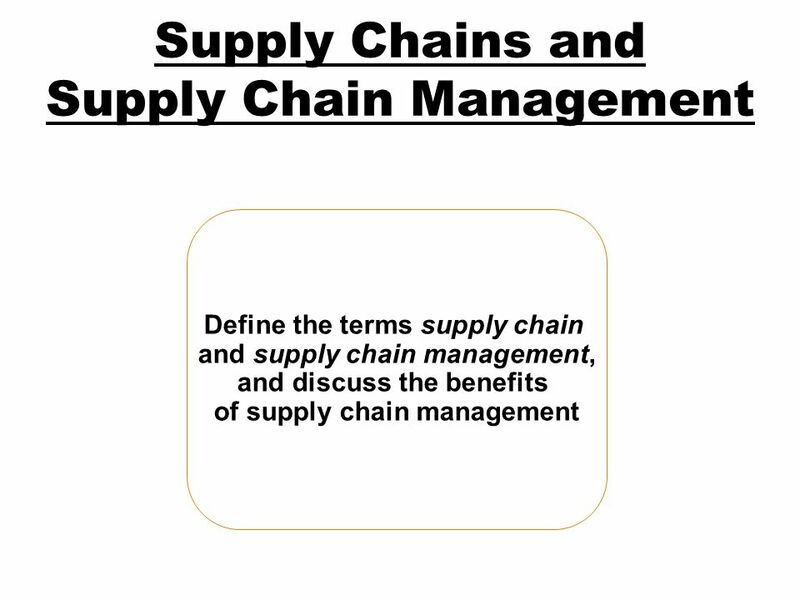 Chapter 12Copyright ©2008 by South-Western, a division of Thomson Learning. 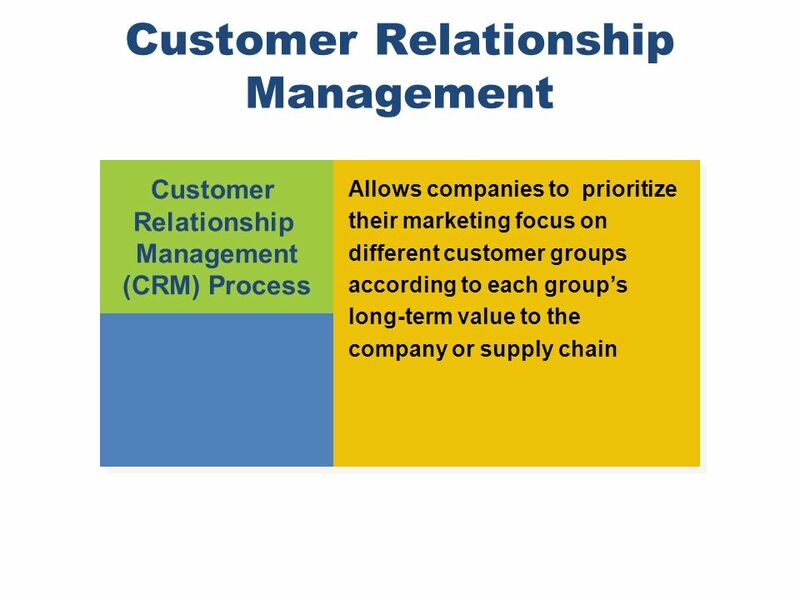 All rights reserved 1 MKTG Designed by Amy McGuire, B-books, Ltd. 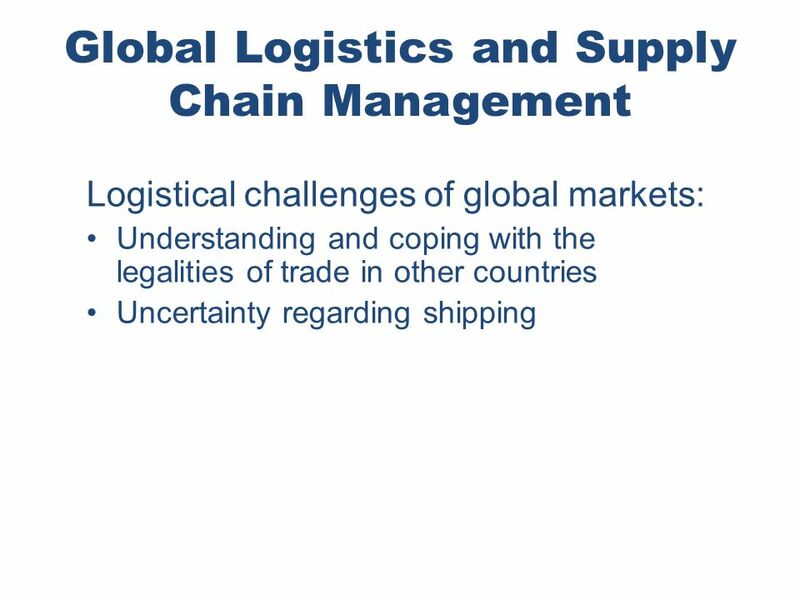 Prepared. 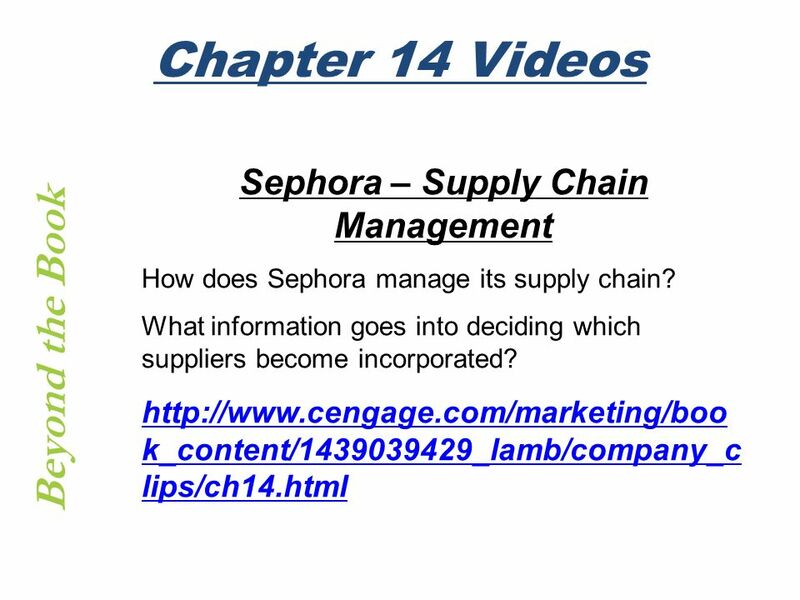 Chapter 14 Copyright ©2012 by Cengage Learning Inc. All rights reserved 1 Lamb, Hair, McDaniel CHAPTER 14 Supply Chain Management © iStockphoto.com/Robert. 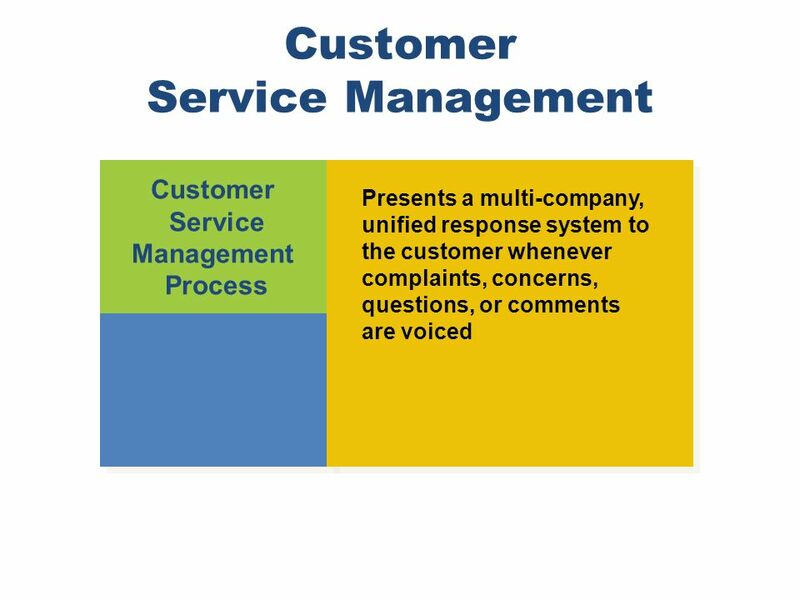 8 - 1 Copyright © 2006, The McGraw-Hill Companies, Inc. All rights reserved.